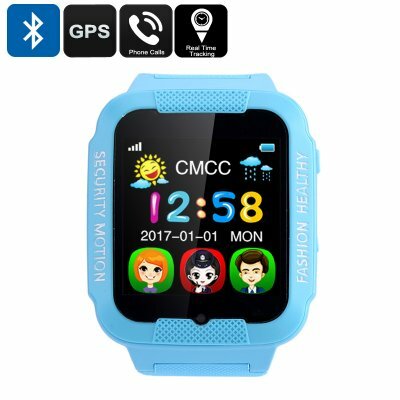 Successfully Added Kids GPS Watch - 1.63 Inch Touch Screen, Bluetooth, Pedometer, Camera, Phone Calls, Electronic Fence, Real Time Tracking (Blue) to your Shopping Cart. Always keep track of your beloved children and never lose them out of sight again with this beautiful Kids GPS watch. Thanks to its intergraded and highly accurate GPS positioning, you’ll always be able to keep track of your children’s whereabouts. From now on you can let your kids go out and have fun without needing to worry about their safety as, with this GPS watch for kids, you’ll always be up to date on where your kids are currently located. A powerful built-in battery provides up to 3 days of standby time so you won’t have to constantly worry about recharging your child’s watch. This child GPS watch itself features a cool design and comes with a sophisticated 1.63 Inch touch screen display. A built-in microphone and speaker allow you to be in contact with your child at any time. Thanks to its SIM card slot, your child will be able to use this phone watch as if it was a regular mobile device. In order to guarantee your child’s safety, this kids GPS watch features an ''anti-harassment'' option thanks to which unknown or blacklisted phone numbers won’t be able to call your child. Like this, you can be assured that your son or daughter never receives a call from an unwanted stranger. So much more than a regular GPS watch, this phone watch also features a pedometer that keeps track of your child’s activity levels – ensuring that they’ll be able to live a healthy lifestyle. Additionally, its touch screen supports basic everyday functions that come in handy for your child at school. Hereby you can think about a calendar, alarm clock, and MP3 music possibilities. A sophisticated 0.3MP camera furthermore lets your child take pictures and video of all his adventures while playing outside with his friends. Additionally, you’ll be able to access this camera, as well as the microphone, from afar whenever you believe your child finds himself in a dangerous situation. Like this, you can always be guaranteed about your child’s safety.